So I opened my Kindle and a copy of “Do the Work” by Steven Pressfield showed up a couple of days ago. This book has been touted by Seth Godin for awhile, and I pre-ordered the free e-book about a month ago. Anyway, I started reading it today and something has already jumped out at me. I’m planning on commenting on some of the things I find in the box as time goes on. 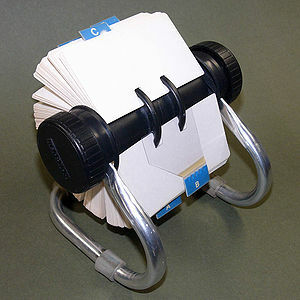 First I need to deal with the breeze from this Rolodex and start checking out the cards.